The third element of the BOLD Value approach of Value Architecture relates to owner exit and legacy planning. Our team provides integrated planning for the owners and key executives – planning that addresses both the needs of the business and the needs of the owner and personal estate. Drawing upon the breadth of our team and broader Sagemark expertise, our team coordinates specialized planning spanning estate planning, retirement and investment planning, insurance analysis, capital succession planning, and investment banking relationships. Our approach focuses on solutions that work as well for executives in the business domain as for individuals in the personal domain. 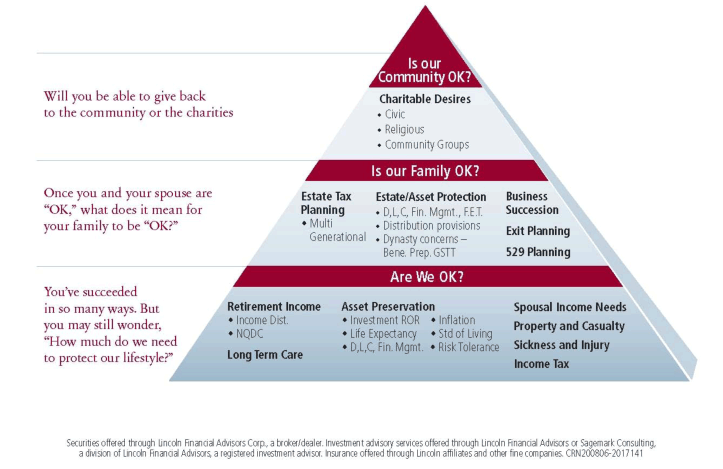 Our holistic, integrated analysis and advice helps ensure that these personal, family, and community considerations are balanced with executive compensation and capital structure planning to yield 360 degree solutions. Business owners and executives benefit from a unified approach to managing retirement solutions, investments, insurance strategies, and succession/estate planning within or beyond the four walls of the middle market business. Our BOLD Value process is truly unique in how it accomplishes this aim.